Yesterday, on Feb. 5, 2018, stocks saw their largest single-day losses for the Dow (in terms of points) since August 2011. At one point the Dow fell nearly 1,600 points before climbing back to finish the day down 1,175 points, or -4.6%. All told, since peaking at 26,616.71 on Jan. 26, the Dow Jones fell 8.5%, to 24,345, by Feb. 5. While the drop had many on Wall Street panicking, that's technically not even considered a correction, which is defined as a drop of more than 10%. 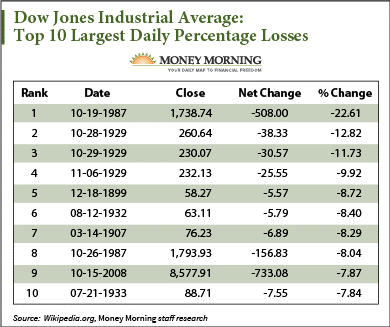 The largest-ever percentage loss for the Dow, of 22.6%, on Oct. 19, 1987, is infamously known as "Black Monday." Most believe the cause of Black Monday was what is known as "program trading." Program trading is a type of securities trading where groups of 15 stocks or more are traded simultaneously via computer programs. Larger institutions use this method when they wish to quickly trade a large number of stocks at the same time, or to take advantage of a window of price discrepancies between markets – known as arbitrage. 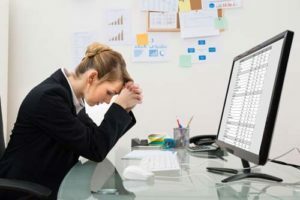 And as you might imagine, the increased prevalence of computer-driven program trading has made markets more susceptible to sudden corrections than ever before. While that certainly sounds intimidating, we'd much rather take more frequent 4.6% down days than a rare 22.6% stock market crash. In fact, Money Morning Chief Investment Strategist Keith Fitz-Gerald predicted we'd see a market pullback in Q1 2018. And he doesn't expect the market to turn bearish as a result. "It's important to remember that the underlying fundamentals we track so closely are not changing as fast as prices are dropping," Fitz-Gerald said. "In fact, they're going in the opposite direction, which means that profits are never far behind."